I love old gear. I collect old gear catalogs (some scans from my collection here.) Even though modern clothing and equipment is (usually) better than old school stuff, there is an undeniable satisfaction in using a piece of gear of clothing that has been around the block and proven itself over the years. There’s some vintage gear you couldn’t pay me to use (old ice screws, for example.) However, even though I generally am one of the first people to run out and buy the latest and greatest stuff, there are some pieces of gear that I’m still using that’s many years (sometimes decades) old. Karrimor: It’s no secret I’m a big fan of vintage Karrimor rucksacks. I have a web page devoted to vintage Karrimor packs here. 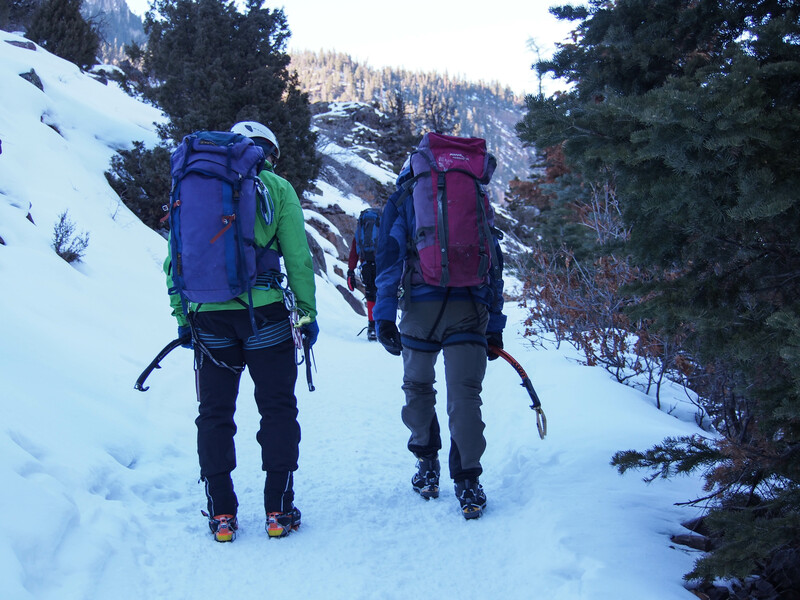 My Karrimor packs are no longer my first choice for long alpine routes, but they are my go-to cragging packs. Two generations of Karrimor Alpiniste backpacks, and two generations of climbers. The Pink Alpiniste is older than the climber carrying it. 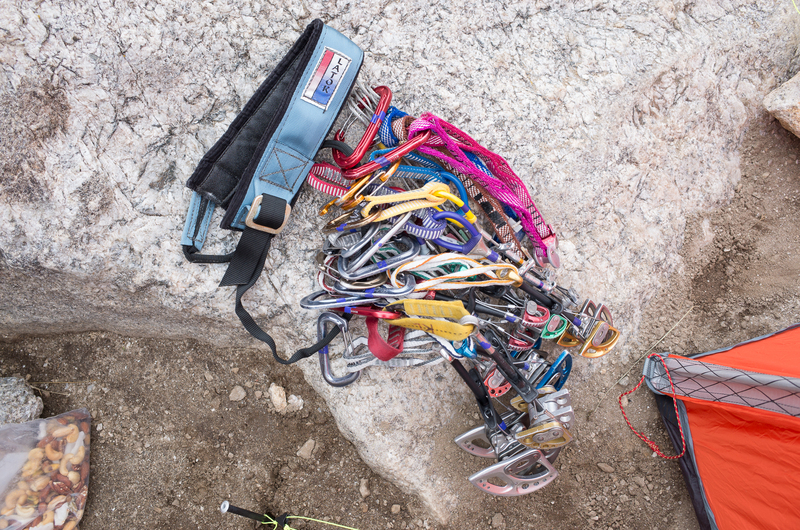 When I started climbing, Chouinard Equipment was the premier mountaineering company. Although my old Chouinard hexes have been replaced with cams, and my Chouinard X-Tools have been replaced by new leashless tools, there are a few pieces of Chouinard gear that I’ve held on to and still use. 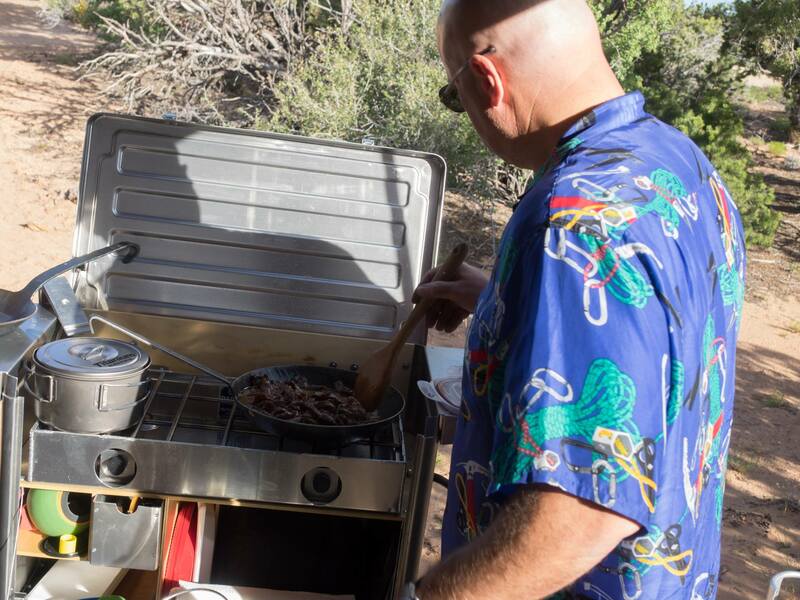 The Chouinard Hawaii 5.10 shirt is an awesome Hawaiian shirt with a climbing gear theme. I’ve seen them go on Ebay for over $400, but I’m not even tempted to sell it. Here it is, keeping me cool in the Utah desert near Indian Creek. 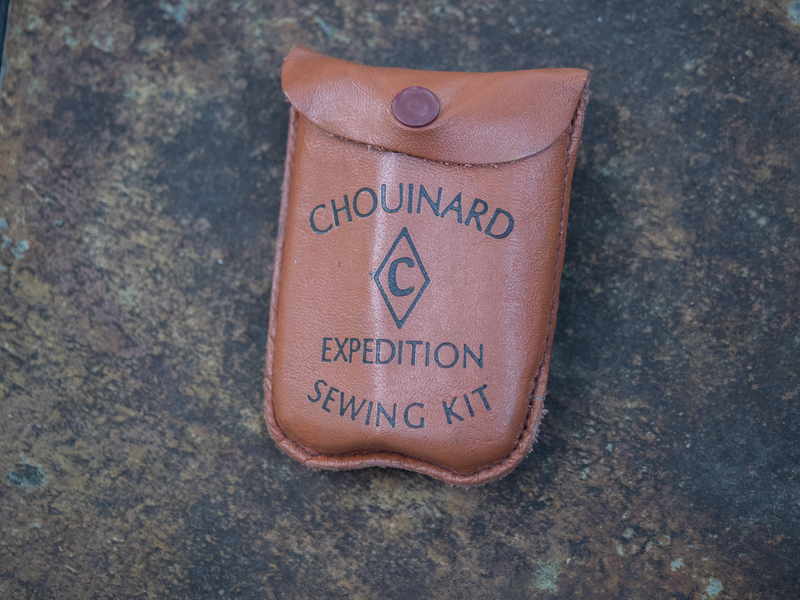 This Chouinard Expedition Sewing Kit holds needles, thread, sewing awl for sewing heavy pack fabrics, repair tape, and other necessities. Cotton interior. Nylon exterior. Tough. Comfortable. 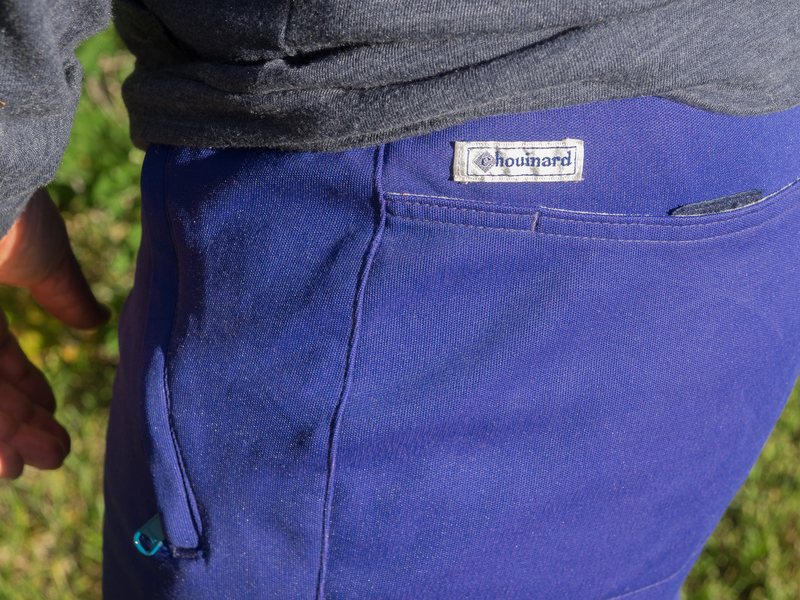 Chouinard Rock Bottoms climbing pants. Still cragging. 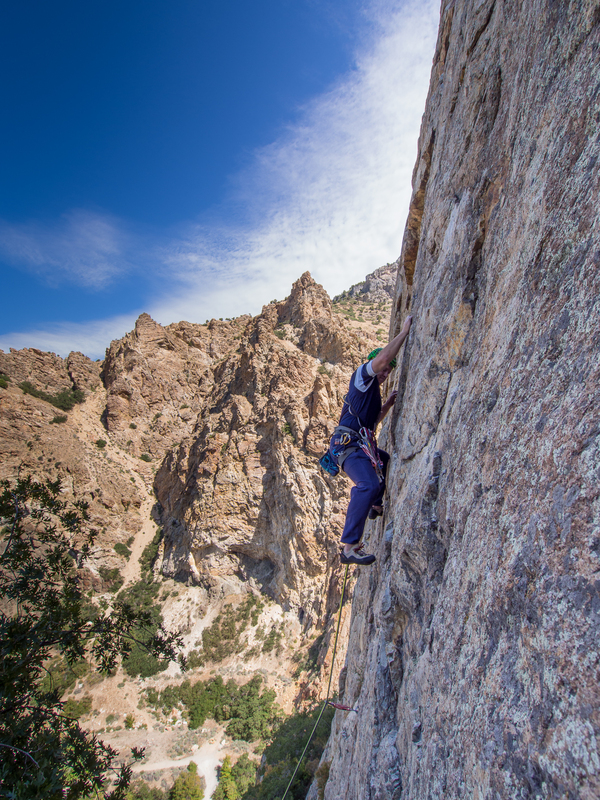 Jeff Lowe has been one of the most prolific innovators in climbing equipment and clothing. Although I’m not going to go back to using Snargs instead of modern ice screws, there’s still some Lowe gear that I’m using. 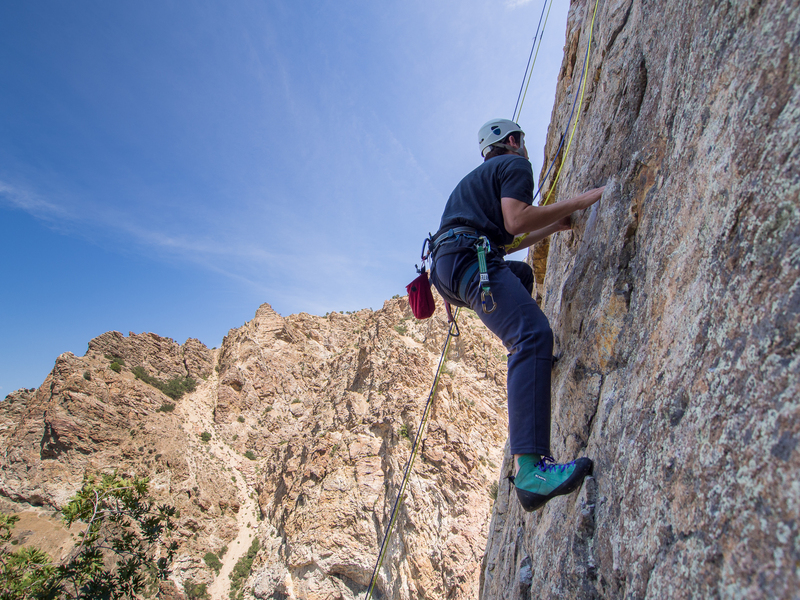 Old school leather boots and Lowe Footfangs still climbing. 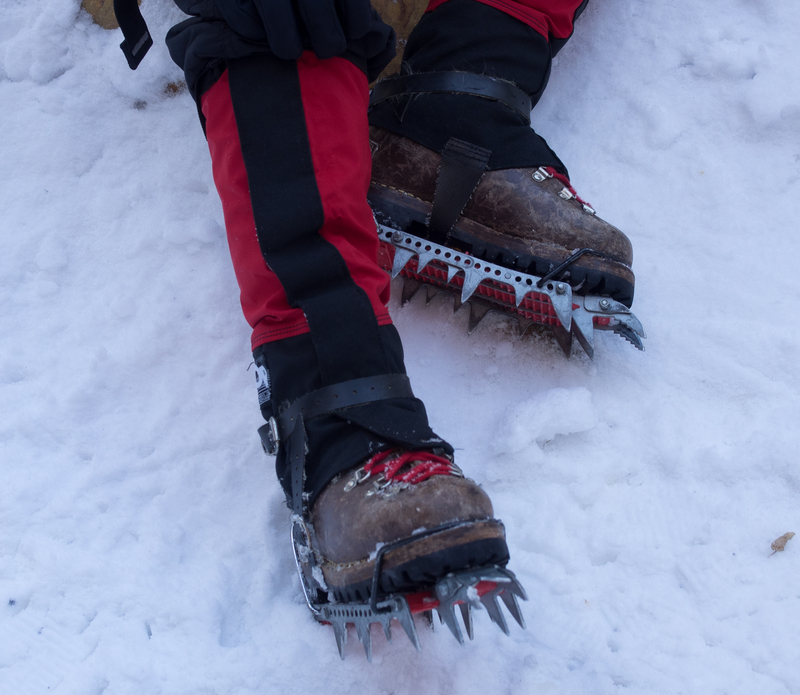 I don’t use these myself, but I loaned the boots and Fangs to a friend for his son to use at the Ouray Ice Park, 2013. Latok Gear Sling. Lightly padded, adjustable, with a tacky material that keeps it from sliding around on your shoulder. Made circa 1986, and I haven’t yet found anything better for alpine climbing. The Papillon sweater is named for its “butterfly” neck closure that has two “wings” of material that zip up to create a very cozy closure around your neck. 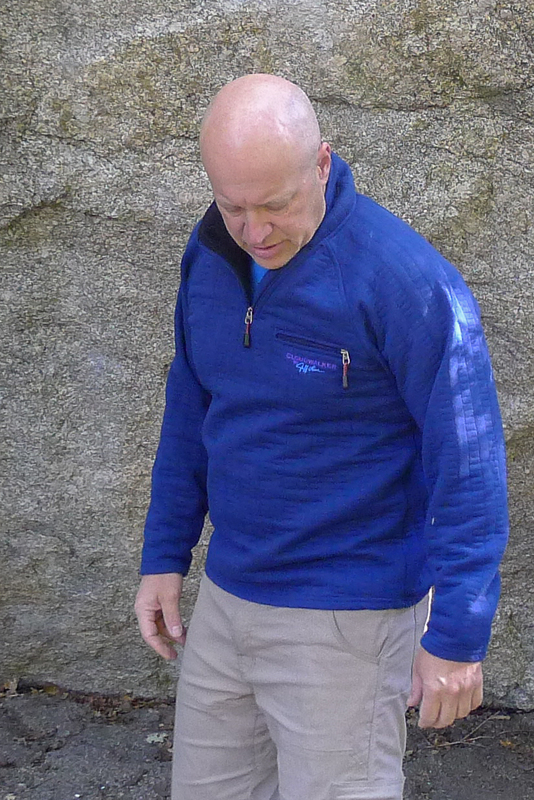 I really like this design, and over the years, I’ve only seen two other pieces of clothing with this feature (the original Lowe Papillon fleece sweater and the original Patagonia Talus softshell pullover.) This particular sweater is made from a quilted fabric that is soft, wind resistant, and hard wearing. It makes a great cold weather rock climbing piece. 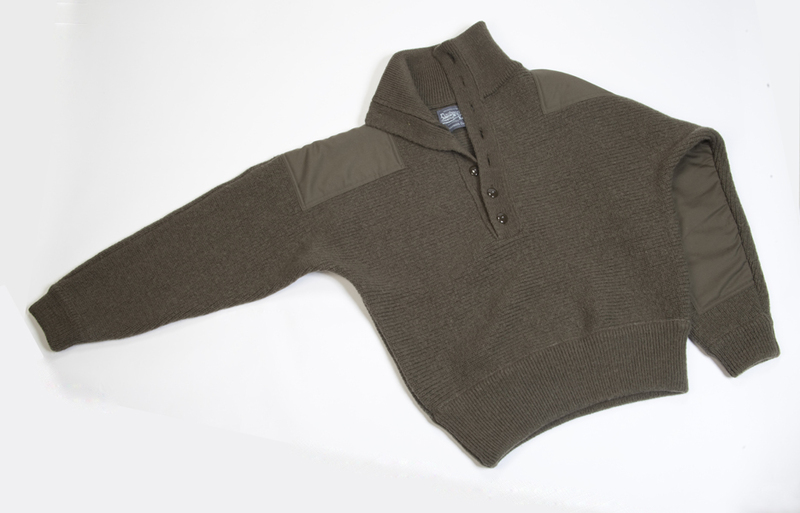 Dachstein sweaters were the original insulated softshells. These sweaters are knit in Austria from heavy wool, which is boiled and felted to provide extra wind and weather resistance. They are warm, durable, wind and water resistant, and have a surprisingly broad temperature comfort range. 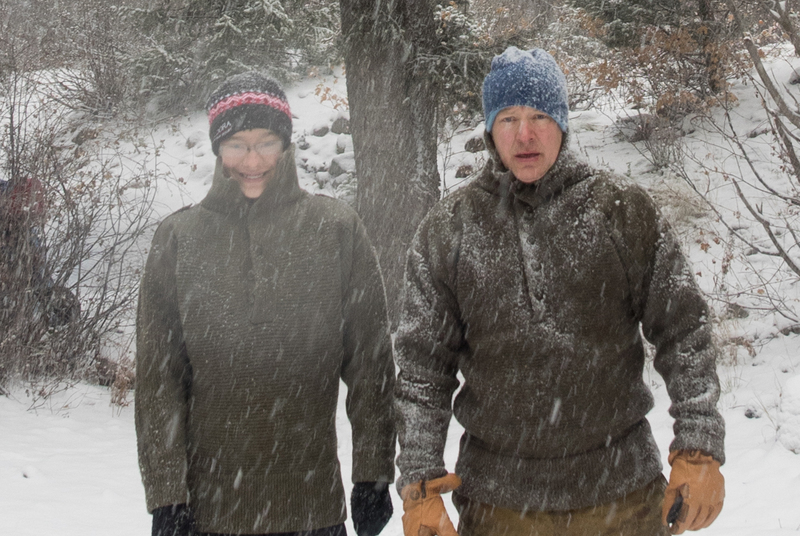 I don’t use my Dachstein sweater for anything technical (they are too heavy) but my Dachstein is still my go-to clothing for cool and cold weather car camping, wilderness survival practice, and working outdoors in the winter. Dachstein Sweaters in Winter Conditions. My son (on the left) is wearing my original sweater, which I outgrew a long time ago. I got the one I’m wearing on ebay a few years ago for $70. If you can’t find a suitable Dachstein sweater on ebay, the Sweater Chalet sells them brand new on their website. Today’s shoes are all downturned, slingshot-randed, slip-lasted high-performance affairs. Sometimes, however, all you need is a comfortable pair of shoes with sticky rubber. Calma Lynx. 28 years old, and still climbing. Still a good shoe for long days on granite. 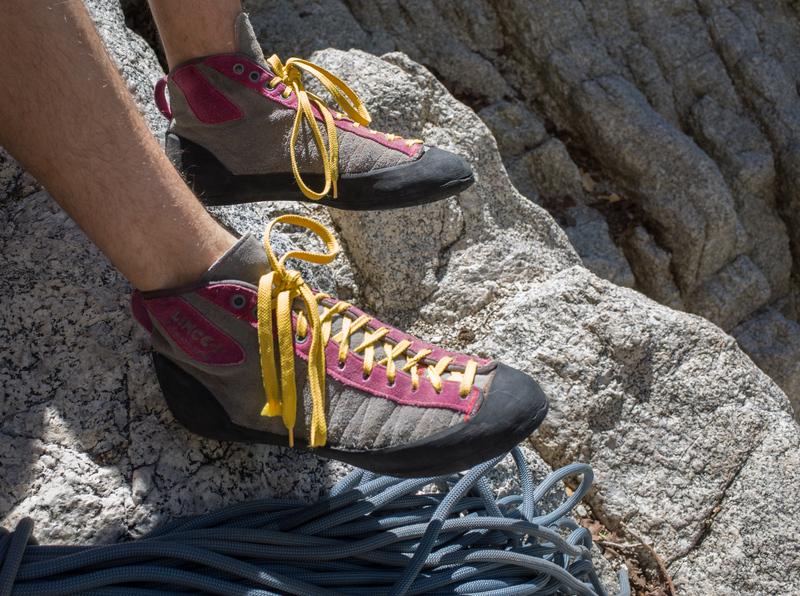 These Scarpa Brio rock shoes have been resoled twice, and are older than the climber who’s wearing them. Revue Thommen is a venerable Swiss company known for making mechanical watches and traditional aneroid altimeters. 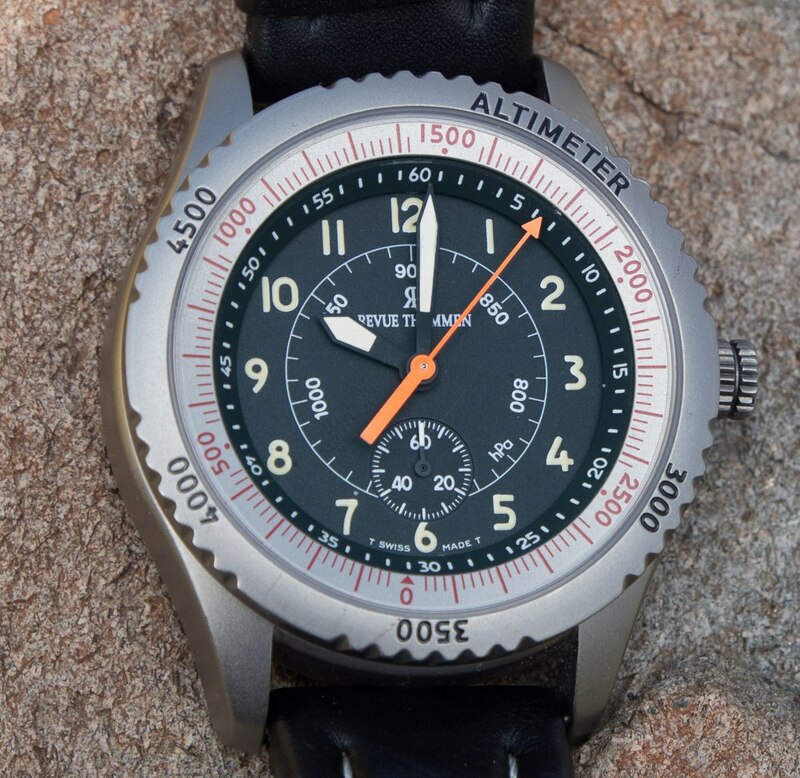 They were not the first company to make an altimeter watch (The first altimeter watch was the “Bivouac” watch by Favre Leuba.) However, the Revue Thommen Airspeed Altimeter was to my knowledge the 2nd watch to incorporate a mechanical movement coupled with an altimeter. It’s a beautiful and elegant piece of Swiss engineering. It’s calibrated in meters, which makes it a bit of a chore to use in conjunction with U.S. maps, and it is not as accurate or useful as a GPS, but I still take it to the mountains on occasion. 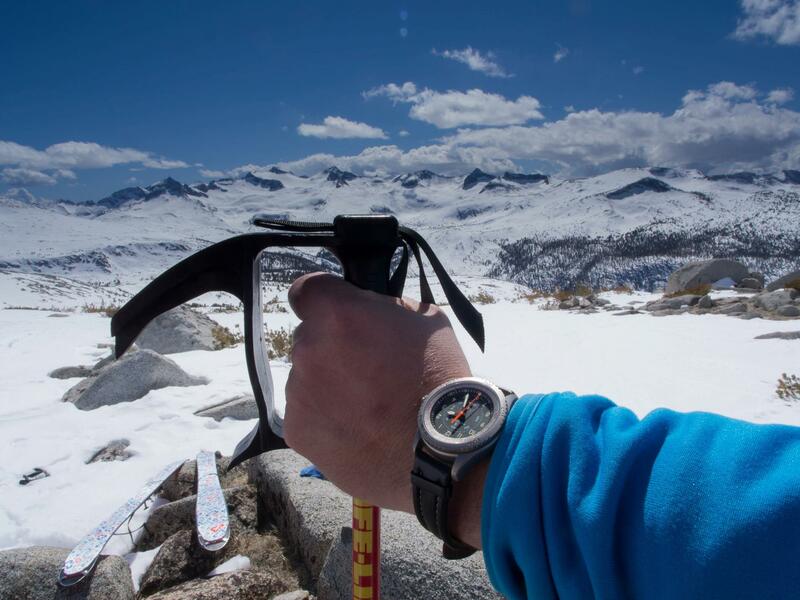 Revue Thommen altimeter watch and granite. Navigating through a ski traverse in the high Sierras. This entry was posted in Backcountry Gear Reviews and tagged chouinard, Chouinard expedition sewing kit, Chouinard hawaiian shirt, foot fangs, hawaii 5.10, karrimor, karrimor alpiniste, lowe cloudwalker, lowe latok, Lowe Papillon, mediocre mountaineering, revue thommen altimter, vintage climbing gear by Kai. Bookmark the permalink. Great site. Thank god for the old school! Nice site! I love the catalog scans. I curate verticalarchaeology.com and would love to compare notes/share info or swap stories about cool old equipment. I have a box full of old equipment that might have belonged to a camper/climber during the late first half of the 1900s. Some of the vintage equipment is in original boxes. There is a Primus Model 96 stove – 1937 (I think), V.A.HJORTH & Co., STOCKHOLM, SWEDEN; several compasses; instruments to measure wind velocity; an ice ax; climbing spikes for clamping on shoes; a Sears and Roebuck vacuum thermos; several very interesting measuring devices; device to measure the height of terrain; a water purification device; soil testing kit; a Model 4A; Genaflash flash light; a Richfield European News Map, edited as of May 22, 1940, etc. These items appear to me to have been high tech for the time. I would like to sell them and would appreciate any recommendations in doing so. Ebay is your best bet. There’s a market for just about anything.